Summer blockbuster Jurassic World feels like the perfect choice to continue my Museums in Movies series. The park is a for-profit attraction “selling $7 sodas,” but in essence it’s just a flashy natural history museum. This franchise installment shows us an expanded version of John Hammond’s original vision for prehistoric thrills. With a larger scale comes even more possibility for disaster, though. For me, the scariest scenes were when a flourishing tourist destination became a visitor services hellscape. A low-ranking ride operator facing an angry mob when he must close a ride for “technical difficulties;” and a waiting area packed with hot, tired people enduring transit delays are the type of things that haunt my nightmares. The film’s dinosaur danger arises when Jurassic World’s leaders try to combat a problem familiar to many museums: how to stay relevant to the modern world when you keep retelling the same story. Visitors are no longer wowed by “an interactive CD-ROM,” like back in ’93, or even by seeing a live dinosaur. The park has made some admittedly cool upgrades, like adding hologram exhibits or replacing the static Jeep paths with gyroscope pods. Kids can now enjoy hands-on activities like digging for “fossils” or riding a baby triceratops. The park also may have sold out a bit, relying on corporate sponsor naming rights to fund new “attractions.” This makes the film’s abundant product placement winkingly self-referential, like when main characters enter the Samsung Visitors’ Center. Gone are the days of jello and ice cream in a single dining room; now there’s a Starbucks, a Margaritaville and a … Brookstone? Maybe some 1990s wonders still impress. The new-and-improved Jurassic World reminded me of my recent visit to the National World War II Museum in New Orleans, which has opened several shiny additional buildings in the past few years. Its impressive airplane display wing is funded by, and named for, Boeing. You can even buy coffee cups with the vintage Boeing logo in the gift shop. The WWII Museum’s newest exhibit, The Road to Berlin, features interactive touch screen kiosks and several surround-sound battle simulation set pieces. The latter seem to be a trend in museums dealing with military history; even the modest museum at Woodrow Wilson’s birthplace in Staunton, VA invites visitors to walk through a trench amidst explosion sound effects. Similarly, one of the old guard of historic sites, Colonial Williamsburg, recently announced plans for a petting zoo and a flintlock shooting range, which I hope will operate on opposite ends of Duke of Gloucester Street. Alas, Jurassic World’s innovation efforts are foiled by not just the usual shady bioethics, but an incompetent organizational culture. The park has grown too big and too automated for staff to communicate and collaborate well. Despite sinking millions of dollars into a high-risk new genetically-engineered “asset,” the staff have raised it incompetently. They have failed to consult expert dinosaur handlers about its habitat, and don’t even know the creatures of which it has been composed. Is no one in this place capable of writing a professional email? Different park authorities view its dinosaurs not as living creatures, but as products or weapons that will bring flashy results. Contrast this with the detailed knowledge and geeky wonder the original Jurassic Park characters display. At the beginning of that film, Dr. Alan Grant brings a grumpy teenage boy from skepticism to fearful awe with dramatic storytelling and just one velociraptor claw prop. That’s the kind of dynamic interpretation that really builds visitor loyalty. Unfortunately, the screenwriters of Jurassic World show neither understanding nor good storytelling in their treatment of female characters. While Owen (Chris Pratt) gets to swagger around as a funny, brave and generally hunky specimen of red-blooded American manhood, the ladies are either nagging shrews or uptight workaholics. Re-enacting Nobel Laureate Tim Hunt’s infamous recent comments about women in science, they attract romantic overtures from colleagues and even cry in the computer lab. Diligent mission control tech Vivian sensibly pairs a cardigan, tights, and flats with her modest dress, but is still #distractinglysexy to her male colleague Lowery at his messy desk. Spoiler alert: the saucy minx ultimately rejects his advances. Even though women –including single mothers- are increasingly taking on museum leadership roles, Jurassic World subjects us to the tired Hollywood syllogism that female professionalism is a zero sum game. The more effort a woman movie character puts into her job, the more she will neglect her personal relationships. The Big Meeting must always conflict with boyfriends’ birthday parties and dinner with relatives, because apparently scheduling and vacation time don’t exist. Sure enough, park operations director Claire (Bryce Dallas Howard) is so busy running things that she ignores her sister’s calls and doesn’t even remember her nephews’ ages, blowing off their visit. The film mocks her for studying prospective donor names and having visitor stats ready for her boss – both of which would be expected of someone in her position. We even get a reminder that Claire should really have kids someday, even though nothing is said about the male staff’s family status. I’ll admit, Claire’s John Hammond-esque white ensemble was lovely, but she couldn’t have ditched the skirt and heels for something more practical for sprinting through the forest? Jurassic Park‘s Dr. Ellie Sattler and her khaki shorts would be appalled. That previous heroine also managed to keep her maternal instinct intact doing extensive fieldwork, and didn’t flinch from danger, quipping “We can discuss sexism in survival situations when I get back.” By the end Claire does channel a little of Dr. Sattler, becoming more protective and proactive, but she’s still a poor role model. Despite its lame characterization, Jurassic World still manages to be a fun, exciting dinosaur thrill ride full of homages to its origin story. It’s a more logical continuation of the Jurassic Park world; let’s ignore the other two lame sequels and call this the reboot. If amidst the summer entertainment, a few kids get inspired to keep learning about paleontology, then the special effects haven’t been in vain. Really, that’s what all museums hope for each vacation season. 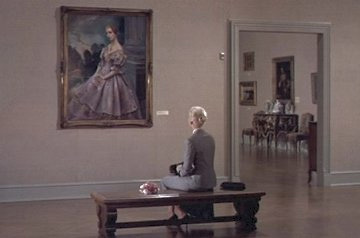 This is an installment in an occasional series about depictions of museums in film. What elements of these movie reflect real life, and what is pure Hollywood fantasy? The theme of this movie is “Jimmy Stewart be creepin’.” Also “historic sites will try to haunt and kill you.” There are actually some similarities to When in Rome – obsessive love, charmed and cursed objects – but here horror is the director’s intention, not a side effect of bad writing. Vertigo is complex enough for some genuine nerdtastic analysis. Jimmy Stewart plays John Ferguson aka Scotty, a San Francisco police detective sidlined by the vertigo and acrophobia he recently developed on an intense suspect chase. He copes with forced retirement by hanging out with his platonic-but-not-really BFF Midge, who inhabits a modernist world that is too dull, practical, and safe. One of her design projects is a backless, strapless cantilever bra, reducing the mysterious female figure to engineering formulas. (And let’s be honest ladies – that contraption would never work.) Bertoia chairs and soothing Mozart aren’t enough to win Scotty’s heart. Poor Midge. Like her Mattel namesake, she’ll always be the runner up. Luckily, a commission from a old friend gets Scotty back in action. Gavin Elster is concerned that his wife Madeleine may be possessed by her Haunting Tragic Ancestor, and so hires Scotty to tail her. The world of the Elsters is more exciting and mysterious. It’s also color coded. When husband is in charge, we see red. His plush office carpet is tomato colored, and the dining room at Ernie’s Restaurant has some out-of-control ruby flocked wallpaper. Green is the wife’s signature color, at least when her identity is solid. She wears green outfits, drives an emerald car, and later appears near a lime neon sign. When things start to get hazy, she’s often clad in gray or earth tones. Ok, you’re saying, enough about decorative arts; where’s the museum you promised me? Actually there are several historic places on display throughout the film. Historians and detectives do a lot of the same work, except the people scholars stalk are already dead. Scotty’s travels around San Francisco looking for information resemble the scavenger hunt that is historical research. Unlike your researcher correspondent, he has the uncanny ability to find perfect parking spots everywhere he goes. Don’t forget to check out the dec arts around the corner, ma’am! First, there’s the art museum where Mrs. Elster goes to stare at the Haunting Tragic Ancestor Portrait of DOOM. Thanks to Scotty’s visual acuity, he notices that her hair and flowers are the same as those in the painting. A+ for connoisseurship! As a reward, he gets a free catalog from a cheerful security guard. For reals? Parking at this museum is awesome too – he just pulls up at the front curb.I want to go on a field trip there. Second, Madeleine heads to another favorite primary source – a cemetery. She pauses to stare at the Haunting Tragic Ancestor Grave of FOREBODING. Scotty wisely takes notes on the inscription afterwards, instead of making a rubbing of of the stone and potentially damaging its surface. A+ for conservation! Then, the lady in gray leads him to the Historic House Hotel of MYSTERY. This house has late 19th century aesthetic movement furnishings – did it seem stale and dated to 1960s audiences, or charming and olde timey? Either way, Scotty is too busy extorting information from Ellen Corby the desk lady to look for clues in the interiors. C for decorative arts appreciation, you’re slipping. Luckily Scotty redeems himself by interviewing Midge’s friend the bookstore owner about Haunting Tragic Ancestor. A+ for oral history records, and he’s back in my good graces. Then Madeleine makes her Ophelia-like leap into San Francisco Bay, and while she’s recovering Scotty gets her to spill about the Historic Mission Town of NIGHTMARES. That’s it, time for a roadtrip to the living history village. When they get there she lures him into the Livery Stable of ADULTEROUS SMOOCHING, and has flashbacks about growing up in the ye olde days. He’s all “Honey, I know the brochure said you would step into life in the past, but this is weirding me out. Also, when was the last time you heard someone say ‘livery stable’ in everyday conversation?” Before he can get her out of the carriage and back into the 20the century, she makes a run for the Mission Bell Tower of DEATH and DIZZINESS, and that’s when things really start to get crazy. I won’t spoil the rest, since the film’s power lies in all the unanswered questions. What is reality? Who can be trusted? Is the past out to get us? Can Scotty use the power of fashion to manipulate womankind and his own heart? Were those real nuns or costumed interpreters? No matter the answers, Hitchcock gets an A++ for using the unknowns of history and the multiple meanings of objects to tell a spellbinding story. Much of of Beth’s job involves extracting large donations from wealthy patrons on the board of trustees. Beth seems quite familiar with the museum’s permanent collection, and gives private tours to potential investors. Beth fell in love with the Guggenheim visiting it as a child. If you ask any of my grad-school classmates they can tell you about fond childhood memories of museums or antiquing. Beth’s boss, a Miranda Priestly clone played by Anjelica Huston, wears statement jewelry and does not tolerate personal lives interfering in work. This caricature of an uber-curator scowls at the prospect of Beth being out of town for her sister’s wedding. Unlike her angelic sister, Beth has not been lucky in love, no doubt because her manic career goals in graduate school sapped her emotional energy. Okay, that’s about it. Sadly, there’s a lot more that doesn’t make any sense. This character might as well be a journalist or fashion designer or other generic chick flick job. Despite her low-ranking position, Beth makes enough money for a sizable Manhattan apartment. So does her suitor, who works in the even more financially doomed field of print media. Beth doesn’t believe in magic, despite that fact that she has her dream job at the museum she loved as a child. Although Beth does curate an exhibition, her job really seems to be more event planning than scholarship. Why the heck is she assembling gala programs at her home? That’s the development department’s job! Her choice of 3Oh!3 songs as the soundtrack to an exhibit opening suggests either an attempt to be relevant to young urbanites or the emotional maturity of a 15 year old . For someone with at least an M.A. in art history, Beth seems pretty oblivious about Europe. In her staff meeting, she has to specify that her sister’s speedy wedding will occur in Rome, Italy. (So… not the one in Texas?) The fact that the Guggenheim has a branch in Venice makes this really inexcusable. To make matters worse, once she gets herself off a plane and into a Roman taxi, Beth takes no interest in scenic views of architecture or statuary. PUH-LEASE. Even my most iPhone addicted colleagues would stop checking email to, I dunno, gawk at the art they have chosen as their life’s work. Just when I thought things might not be completely predictable, there were both a race through traffic at a critical moment and a runaway bride. What, you didn’t have time for someone to dash through an airport? In the end, I decided to enjoy When In Rome by accepting it as a total slapstick farce, something like a really bad Marx brothers movie. After all, Beth’s four magic fountain stalkers are practically a Chico and three Harpos. Also, the scenes in Italy are about as authentic as this number from the Marx’s A Night at the Opera. Hmm, the Marx brothers at the Guggenheim – now there’s an exhibit I would curate.